Receding floodwaters and heavy rains are creating a perfect storm of conditions that have contributed to the highest level of West Nile virus activity in the state’s mosquito population since the disease was first discovered here in 2000, according to the Pennsylvania Department of Environmental Protection (DEP). The disease, which has infected more than 150 people in the past six years, is on track to pose a higher than normal risk this year and is widespread throughout the Commonwealth, having already been found in 51 Pennsylvania counties as of Aug. 1. DEP and county partners throughout the state also conduct routine, localized spraying events to control infected adult populations of mosquitoes. These operations are conducted when and where deemed necessary based on recent population survey results, but they are not a substitute for preventive measures like eliminating standing, stagnant water. As part of the state budget, a $140,000 increase was added to the mosquito surveillance program. Symptoms of West Nile virus in humans are typically like those of a mild flu, but the virus can lead to a more serious condition that includes swelling of the brain, muscle convulsions, coma, paralysis and death. Since DEP first began monitoring for the virus in 2000, 33 fatal cases have been reported in Pennsylvania. Pennsylvania residents are urged to take commonsense precautions to protect themselves from mosquitoes. By eliminating places for mosquitoes to lay eggs, using insect repellant and other protective measures, and targeted use of pesticides, we can all make sure Pennsylvanians are protected. 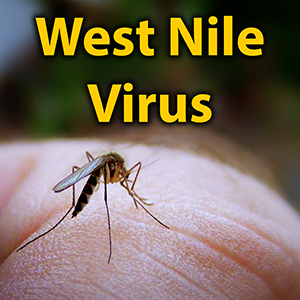 For more information about West Nile virus, click here. 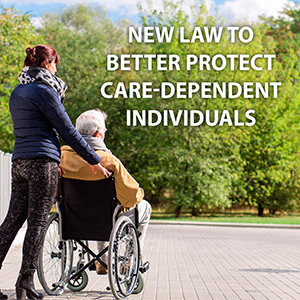 A new law taking effect soon will better protect individuals who are dependent upon others for their care. Act 53 of 2018 will make it a crime to intentionally or recklessly endanger a care-dependent person – closing a gap in state law that exists between neglect and abuse. This addition to the Crimes Code includes neglect to provide care which causes a serious injury or death. This stems from a Bucks County case in which an elderly man was neglected so badly by four family caregivers his starvation led to septic shock. The new law also adds abuse of a care-dependent person as a punishable offense – with the former law focusing only on neglect investigations – and expands the definition of a caretaker to include family members who should be held responsible. This law was necessary because some care-dependent people, who are among the most vulnerable groups of people in the state, were left without direct protections from the abuse and neglect by their caretakers. The law allows the departments of Aging, Health and Human Services to report suspected abuse or neglect to district attorneys or the attorney general’s office. Penalties vary from a first-degree felony for death of a care-dependent person to a second-degree misdemeanor if a caretaker knowingly endangers a care-dependent person by failing to provide for his or her needs. Soon, students will head back to class. Motorists, parents and children are encouraged to refresh their memories about how to share the road safely with school buses and other school transportation vehicles. Pennsylvania law requires motorists stop at least 10 feet away from school buses when their red lights are flashing and their stop arm is extended. Motorists following or traveling alongside a school bus must also stop until the red lights have stopped flashing and the stop arm is withdrawn. Do not proceed until all children have reached a place of safety. Penalties for failure to obey school bus safety laws can result in a $250 fine, five points on a driving record and a 60-day license suspension. Parents are reminded to ensure that their children are at the bus stop early to avoid rushing. Students should stay where the bus driver can see them while boarding or exiting the bus. 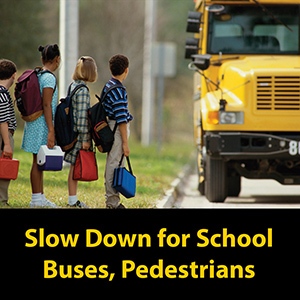 Click here for more information and tips on school bus safety. 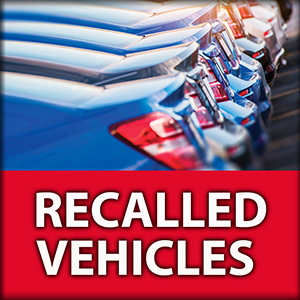 With more vehicles being the subject of nationwide recalls, a new law taking effect on Aug. 27 will require all new and used vehicle dealers licensed in Pennsylvania to disclose, in writing to used vehicle purchasers, the existence of any open, unrepaired recalls. Under Act 59 of 2018, a dealer would be in compliance with the disclosure requirement by providing the used vehicle retail purchaser with a report obtained from the website, www.safercar.gov, or a successor website, based on a vehicle identification number search. Consumers would still have the option to pursue civil action if a dealer fails to disclose existence of open recalls. 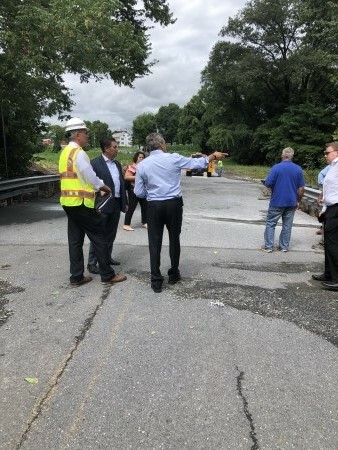 Earlier this month, I joined Congressman Lou Barletta; state, local and county officials; and representatives from PennDOT to see some of the infrastructure damage caused by the recent flooding in the 106th District. 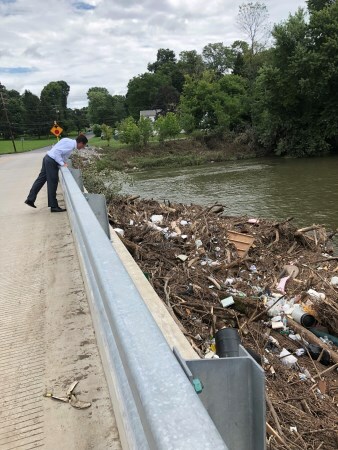 All levels of government are working together to get our roads and bridges cleaned up and repaired quickly. We also had discussions about what can be done to mitigate flooding in these areas in the future. 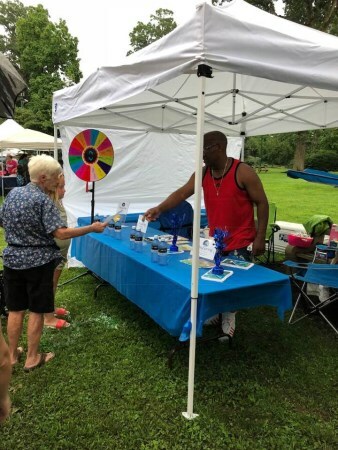 A great time was had by all at our community National Night Out celebrations, which are held annually to promote police-community partnerships and community camaraderie. 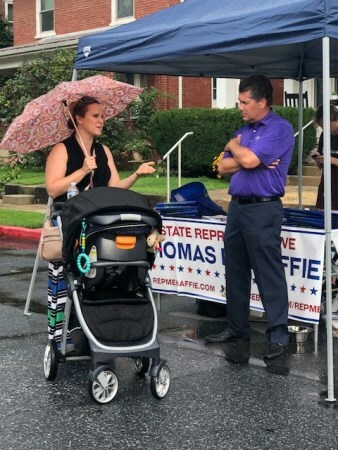 My staff and I had tables at all three events (Derry Township, Swatara Township and Middletown Borough-Lower Swatara Township). 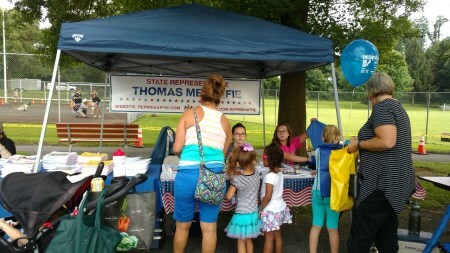 Thank you to all the families who stopped by to say hello! I recently presented a commemorative copy of the House of Representatives resolution deeming June 28, 2018, as Amusement Park Day in Pennsylvania to Laura Woodburn, Director of Attractions and the Guest Experience at Hershey Entertainment & Resorts. Hersheypark was one of 14 amusement parks celebrated by the resolution for its role in bringing local families and travelers to the Keystone State. 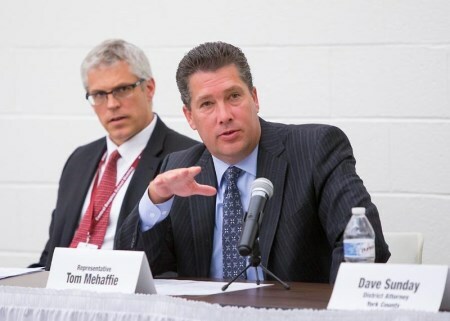 Last week, I participated in a public round table on school safety with the Senate Majority Policy Committee. We received input from education and safety experts about local challenges when it comes to our region’s school safety efforts and discussed things we can do at the state level to ensure schools have the resources and tools they need to protect the lives of students and school employees. I specifically mentioned how the issue of bullying can be a contributing factor to school violence. 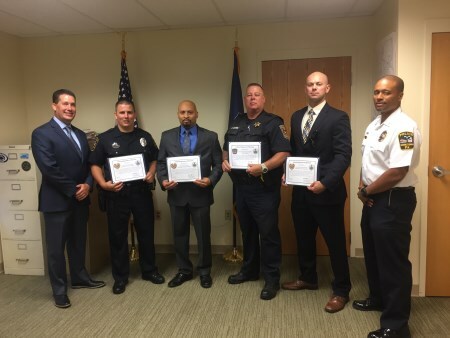 I was pleased to present certificates of recognition to Middletown Police Department’s Officer Tyler Zehring, Detective Gary Rux, Officer Adam Tankersley and State Constable Jeffrey Shank. These men displayed heroism while assisting firefighters and EMS personnel in trying to rescue a woman from a house fire this past spring. Also featured in this photo is Police Chief George Mouchette.